"And when he had spoken these things...he was taken up, and a cloud received him out of their sight." "Why stand ye gazing up into heaven? This same Jesus...shall so come in like manner as ye have seen him go." Then, a little later in the Acts, it says that "heaven" must receive Jesus until "the time of restitution". Given that this was the very month in which Mary Magdalene’s child was due, is there perhaps some connection between Mary’s confinement and the so-called Ascension? There certainly is, and the connection is made by virtue of the time of restitution. Not only were there rules to govern the marriage ceremony of a Messianic heir, but so too were there rules to govern the marriage itself. The rules of dynastic wedlock were quite unlike the Jewish family norm, and Messianic parents were formally separated at the birth of a child. Even prior to this, intimacy between a dynastic husband and wife was only allowed in December, so that births of heirs would always fall in the month of September, the month of Atonement, the holiest month of the Jewish calendar. Indeed, it was this very rule which Jesus’s own parents (Joseph and Mary) had themselves broken. And this was the reason why the Jews were split in opinion as to whether Jesus was, in fact, their true Messiah. "Joseph, her husband, being a just man and not willing to make her a public example, was minded to put her away privily". From the moment of a dynastic birth, the parents were physically separated, for six years if the child was a boy, and for three years if the child was a girl. Their marriage would only be recommenced at the designated time of restitution. Meanwhile, the mother and child would enter the equivalent of a convent, and the father would enter "the Kingdom of Heaven". This Kingdom of Heaven was actually the Essene High Monastery at Mird, by the Dead Sea, and the ceremony of entry was conducted by the angelic priests under the supervision of the appointed Leader of the Pilgrims. In the Old Testament book of Exodus, the Israelite pilgrims were led into the Holy Land by a "cloud", and in accordance with this continued Exodus imagery, the priestly Leader of the Pilgrims was designated with the title "Cloud". If we now look at St Paul’s Epistle to the Hebrews we discover that he explains the said Ascension event in some greater detail, for Paul tells of how Jesus was admitted to the Priesthood of Heaven when he actually had no entitlement to such a sacred office. He explains that Jesus was born (through his father Joseph) into the Davidic line of Judah, a line which held the right of kingship but had no right to priesthood, for this was the sole prerogative of the line of Aaron and Levi. By following the chronology of the Acts, we see that in September AD 37 a second child was born; and then another in AD 44. The period between these two births to the second restitution in AD 43 was "six years", which denotes that the AD 37 child was a son. This fact is also conveyed by the use of cryptic wording, the same cryptic wording afforded to the AD 44 child, so we know that this third child was also a son. For example, the Gospels explain that Jesus was called "the Word of God": "And the Word was made flesh, and dwelt among us... full of grace and truth." John goes to great lengths to explain the relevance of this definition, and subsequent entries give details such as "the Word of God stood by the lake" and "the Word of God was in Samaria". Messages conveying information about fertility and new life are established in the Parable of the Sower whose seed "bore fruit and increased". Thus, when it is said that "the Word of God increased", "those with ears to hear" would recognize at once that "Jesus increased", that is to say, he had a son. There are two such entries in the Acts, and they fall precisely on cue in AD 37 and AD 44. Probably the most misrepresented book of the New Testament is The Book of The Revelation of St John the Divine, misrepresented by the Church, that is; not by the book itself. This book is quite unlike any other in the Bible. It is dubbed with terrible supernatural overtones, and its straightforward imagery has been savagely corrupted by the Church to present the text as some form of foreboding or prophecy of warning! But the book is not called "The Prophecy" or "The Warning". It is called "The Revelation". So, what does the book reveal? Chronologically, its story follows The Acts of the Apostles, and the Book of The Revelation is, in fact, the continuing story of Jesus, Mary Magdalene and their sons, particularly the elder son, Jesus Justus. It follows his life and details his marriage, along with the birth of his own son. This much-misunderstood New Testament book is not a foreboding or a warning as the fearful Church would have us believe. It is precisely what it says it is: a revelation. Indeed, it was this particular ministerial ritual which Jesus had flouted at the so-called "feeding of the five-thousand", because he presumed the right to grant access to his own new liberal ministry by offering the loaves and fishes to an unsanctified gathering. Apart from eventually becoming a fisher, Jesus was also referred to as "the Christ", a Greek definition which meant "the King". In saying the name "Jesus Christ", we are actually saying "King Jesus", and his kingly heritage was of the Royal House of Judah (the House of David), as mentioned numerous times in the Gospels and in the Epistles of St Paul. From AD 33, therefore, Jesus emerged with the dual status of a "Priest Christ" or, as is more commonly cited, a "Fisher King". This definition, as we shall see, was to become an hereditary and dynastic office of Jesus’ heirs, and the succeeding "Fisher Kings" were paramount in the history of the Grail bloodline. From the earliest times, through the mediaeval era, to the great Renaissance, Mary’s flight was portrayed in illuminated manuscripts and great artworks alike. Her life and work in France, especially in Provence and the Languedoc, appeared not only in works of European history but also in the Roman Church liturgy, until her story was suppressed by the Vatican. "And she, being with child, cried...and pained to be delivered...and behold, a great red dragon, having seven heads...and seven crowns...stood before the woman...for to devour her child... And she brought forth a man-child...and the woman fled into the wilderness... And the dragon was wroth with the woman, and went to make war forever with the remnant of her seed...which...have the testimony of Jesus Christ." It was to Gaul that Mary was said to have carried the Sangréal (the Blood Royal, the Holy Grail); and it was in Gaul that the famous line of Jesus and Mary’s immediate descendant heirs, the Fisher Kings, flourished for 300 years. The eternal motto of the Fisher Kings was "In Strength", inspired by the name of their ancestor, Boaz (the great-grandfather of King David), whose name similarly meant "In Strength". When translated into Latin, this became "In Fortis", which was subsequently corrupted to "Anfortas", the name of the Fisher King in Grail romance. We can now return to the Grail’s traditional symbolism as a chalice containing the blood of Jesus. We can also consider graphic designs dating back well beyond the Dark Ages to about 3,500 BC. And in doing this, we discover that a chalice or a cup was the longest-standing symbol of the female. Its representation was that of the Sacred Vessel, the vas uterus, the womb. And so, when fleeing into France, Mary Magdalene carried the Sangréal in the Sacred Chalice of her womb, just as the Book of The Revelation explains. And the name of this second son was Joseph. The equivalent traditional symbol of the male was a blade or a horn, usually represented by a sword or a unicorn. In the Old Testament’s Song of Solomon and in the Psalms of David, the fertile unicorn is associated with the kingly line of Judah; and it was for this very reason that the Cathars of Provence used the mystical beast to symbolize the Grail bloodline. "And did those feet in ancient time, walk upon England’s mountains green." But who was Joseph of Arimathea, the man who assumed full control of affairs at the Crucifixion? And why was it that Jesus’ mother, his wife and the rest of the family accepted Joseph’s intervention without question? As late as the year 900, the Church of Rome decided to announce that Joseph of Arimathea was the uncle of Jesus’ mother Mary. And from that time, portrayals of Joseph have shown him as being rather elderly at the Crucifixion, when Mother Mary was herself in her fifties. Prior to the Roman announcement, however, the historical records of Joseph depicted a much younger man. He was recorded to have died at the age of 80 on 27 July AD 82, and thus would have been aged 32 at the time of the Crucifixion. In fact, Joseph of Arimathea was none other than Jesus Christ’s own brother, James, and his title had nothing whatever to with a place name. Arimathea never existed. It therefore comes as no surprise that Joseph negotiated with Pilate to place Jesus in his own family tomb. The hereditary "Arimathea" title was an English corruption of the Graeco-Hebrew style ha-Rama-Theo, meaning "of the Divine Highness", or "of the Royal Highness" as we’d define it today. Since Jesus was the senior Messianic heir - the Christ, Khristos or King - then his younger brother was the Crown Prince - the Royal Highness, Rama-Theo. In the Nazarene hierarchy, the Crown Prince always held the patriarchal title of "Joseph", just as Jesus was a titular "David" and his wife was a "Mary". In the early fifth century, Jesus and Mary’s descendent Fisher Kings became united by marriage to the Sicambrian Franks, and from them emerged a whole new ’reigning’ dynasty. They were the noted Merovingian Kings who founded the French monarchy and introduced the well-known fleur-de-lys (the ancient Jewish symbol of circumcision) as the royal emblem of France. Also from the Fisher Kings came another important parallel line of succession in Gaul. Whereas the Merovingian Kings continued the patrimonial ’male’ heritage of Jesus, this other line perpetuated the matriarchal heritage of Mary Magdalene in a ’female’ line. They were the dynastic Queens of Avallon in Burgundy, the House del Acqs, meaning "of the waters", a style granted to Mary Magdalene in the early days when she voyaged on the sea to Provence. Those familiar with Arthurian and Grail lore will by now have recognized the ultimate significance of this Messianic family of the Fisher Kings, the Queens of Avallon and the House del Acqs (corrupted in Arthurian romance to "du Lac"). The descendant heirs of Jesus posed an enormous threat to the Roman High Church because they were the dynastic leaders of the true Nazarene Church. In real terms, the Roman Church should never have existed at all, for it was no more than a ’hybrid’ movement comprised of various pagan doctrines attached to a fundamentally Jewish base. Jesus was born in 7 BC and his birthday was on the equivalent of 1 March, with an ’official’ royal birthday on 15 September to comply with dynastic regulation. But, when establishing the Roman High Church in the fourth century, Emperor Constantine ignored both of these dates and supplemented 25 December as the new Christ’s Mass Day, to coincide with the pagan Sun Festival. Christianity, as we know it, has evolved as a ’composite religion’ quite unlike any other. If Jesus was its living catalyst, then Christianity should rightly be based on the teachings of Jesus himself, the moral and social codes of a fair-minded, tolerant ministry, with the people as its benefactors. But orthodox Christianity is not based on the teachings of Jesus: it is based on the teachings of the Roman Church, which are entirely different. There are a number of reasons for this, the foremost of which is that Jesus was deliberately sidestepped in favor of the alternative teachings of Peter and Paul, teachings which were thoroughly denounced by the Nazarene Church of Jesus and his brother James. Only by removing Jesus from the frontline could the Popes and cardinals reign supreme. When formally instituting Christianity as the state religion of Rome, Constantine declared that "he alone" was the true "Saviour Messiah", not Jesus!. As for the Bishops of Rome (the Popes), they were granted an apostolic descent from St Peter, not a legitimate Desposynic descent from Jesus and his brothers, as was retained within the Nazarene Church. The only way for the Roman High Church to restrain the heirs of Mary Magdalene was to discredit Mary herself and to deny her bridal relationship with Jesus. But what of Jesus’ brother James? He, too, had heirs, as did their other brothers, Simon, Joses and Jude. The Church could not escape the Gospels which state that Jesus was the Blessed Mother Mary’s "first-born son", and so Mary’s own motherhood also had to be repressed. As a result, the Church portrayed Mother Mary as a virgin, and Mary Magdalene as a whore, neither of which description was mentioned in any original Gospel. Then, just to cement Mother Mary’s position outside the natural domain, her own mother, Anna, was eventually said to have borne her by way of "Immaculate Conception"! Over the course of time, these contrived doctrines have had widespread effect. But, in the early days, it took rather more to cement the ideas because the original women of the Nazarene mission had a significant following in the Celtic Church, women such as Mary Magdalene, Martha, Mary Jacob-Cleophas and Helena-Salome who had run schools and social missions throughout the Mediterranean world. These women had all been disciples of Jesus, and close friends of his mother, Mary, accompanying her to the Crucifixion, as confirmed in the Gospels. The Church’s only salvation was to deny women altogether; to deny them not only rights to ecclesiastical office, but to deny them rights to any status in society. Hence, the Church declared that women were all heretics and sorceresses! In this, the bishops were aided by the words of Peter and Paul, and on the basis of their teachings the Roman High Church was enabled to become wholly sexist. "I suffer not a woman to teach, nor to usurp any authority over the man, but to be in silence." "Women are not worthy of life". "He shall rule over thee". "These heretical woman! How dare they! They are brazen enough to teach, to engage in argument, to baptize... It is not permitted for a woman to speak in church...nor to claim...a share in any masculine function-least of all in priestly office." Then, to cap it all, came the Roman Church’s most amazing document, The Apostolic Order. This was compiled as an ’imaginary’ conversation between the apostles after the Last Supper. Contrary to the Gospels, it supposed that Mary Magdalene had been present at the Supper, and it was agreed that the reason why Jesus had not passed any wine to Mary at the table was because he had seen her laughing! But why the vengeful onset of the Inquisition? Because the Knights Templars had not only returned from the Holy Land with documents that undermined the Church’s teachings, but they also established their own Cistercian churches in opposition to Rome. These were not just any churches; they were the greatest religious monuments ever to grace the skylines of the western world: the Notre Dame cathedrals of France. Mary Magdalene, on the other hand, was being portrayed (by the world’s greatest artists) wearing the red mantle of cardinal status or the black robe of a Nazarite High Priestess, and there was nothing the Church could do about it. The bishops’ only option was to proclaim the practice sinful and heretical-because, in having previously elected to ignore Mary Magdalene and her heirs, she was outside their jurisdiction. But why should Grail lore and the writings of Merlin have posed such a problem for the High Church? Because, within the context of their adventurous texts, they told the descendant story of the Grail bloodline, a bloodline which had been ousted from its dynastic position by the Popes and Bishops of Rome who had elected to reign supreme by way of a contrived "apostolic succession". This apostolic succession was said to have been handed down from the first bishop, St Peter (and, indeed, this is still the promoted view). But one only has to study the Church’s own Apostolic Constitutions to discover that this is simply not true. Peter was never a Bishop of Rome, nor of anywhere else, for that matter! The Vatican’s Constitutions record that the first Bishop of Rome was Prince Linus of Britain, the son of Caractacus the Pendragon. He was installed by St Paul in AD 58, during Peter’s own lifetime. From the 1100s, the powerful Knights Templars and their cathedrals posed an enormous threat to the ’male-only’ Church by bringing the heritage of Jesus and Mary Magdalene to the fore in the public domain. The cardinals knew that their whole establishment would tumble if the Messianic descendants gained the upper hand. They had to be crushed! And so the brutal Inquisition was implemented, a hideous persecution of all who dissented from the rule of the bishops. It all began in 1208, when Pope Innocent III sent 30,000 soldiers into the Languedoc region of southern France. This was the home of the Cathars ("the Pure Ones") who were said to be the guardians of a great and sacred treasure, a mysterious secret which could overturn orthodox Christianity. The Pope’s so-called Albigensian Crusade lasted for 36 years, during which time, tens of thousands of innocent people were slaughtered, but the treasure was never found. The main thrust of the Inquisition (or "Holy Office") was instituted by Pope Gregory IX during the course of this massacre, in 1231, and it was set against anyone who supported "the Grail heresy". By 1252, the torture of victims was formally authorized, along with execution by burning. In the light of this, the Templars became a specific target of the Inquisition in 1307 when the henchmen of Pope Clement V and King Philip IV of France were set in their direction. The papal armies scoured Europe for the Templar documents and treasure, but, like the Cathar inheritance, nothing was found. However, many Knights were tortured and executed in the process, and their companions escaped to countries outside the papal domain. But the Templar hoard was not lost, and while the Vatican emissaries were searching, the treasure and documents were locked away in the Chapter House Treasury vaults of Paris. They were under the protection of the Templar Grand Knights of St Anthony, "the Guardian Princes of the Royal Secret", who loaded the hoard one night onto 18 galleys of the Templar fleet at La Rochelle. By daybreak, the fleet had sailed for Scotland, and on arrival they were welcomed by King Robert the Bruce who, along with the whole Scottish nation, had been excommunicated by the Pope for challenging the Catholic King Edward of England. In Scotland, the Templars and their treasure remained, and the Knights fought with Bruce at Bannockburn in 1314 to regain Scotland’s independence from Plantagenet England. Subsequent to the Battle of Bannockburn, Bruce and the St Anthony Templars founded the new Order of the Elder Brothers of the Rosy Cross in 1317, from which time the Kings of Scots became hereditary Grand Masters, with each successive Stewart King holding the honored Grand Priory title of "Prince Saint Germain". So, why was it that King Arthur, a Celtic commander of the sixth century, was so important to the Knights Templars and the Grail courts of Europe? Quite simply, because Arthur had been unique, with a ’dual’ heritage in the Messianic line. King Arthur was by no means mythical, as many have supposed. Far from it. But he has generally been looked for in the wrong places. Researchers, misguided by the fictional locations of the romances, have searched in vain through the chronicles of Brittany, Wales and the west of England. But the details of Arthur are to be found in the Scots’ and Irish annals. He was indeed "the High King of the Celtic Isle", and he was the sovereign commander of the British troops in the late sixth century. Arthur was born in 559, and he died in battle in 603. His mother was Ygerna del Acqs, the daughter of Queen Viviane of Avallon, in descent from Jesus and Mary Magdalene. His father was High King Aedàn of Dalriada (the Western Highlands of Scotland, now called Argyll), and Aedàn was the British Pendragon ("Head Dragon" or "King of Kings") in descent from Jesus’ brother James. It is for this reason that the stories of Arthur and Joseph of Arimathea are so closely entwined in the Grail romances. Indeed, the coronation records of Scotland’s King Kenneth MacAlpin (a descendant of Aedàn the Pendragon) specifically refer to his own descent from the dynastic Queens of Avallon. King Aedàn’s paternal legacy emerged through the most ancient House of Camulot (England’s Royal Court of Colchester) in a line from the first Pendragon, King Cymbeline (who is well-known to students of Shakespeare). By that time, Messianic descendants had founded Desposynic kingdoms in Wales and across the Strathclyde and Cambrian regions of Britain. Arthur’s father, King Aedàn of Scots, was the first British monarch to be installed by priestly ordination, when he was crowned and anointed by Saint Columba of the Celtic Church in 574. This, of course, infuriated the Roman Church bishops because they claimed the sole right to appoint kings who were supposed to be crowned by the Pope! An important fact to remember is that the Grail dynasts were never territorial governors of lands. Like Jesus himself, they were designated "Guardians" of the people. The Merovingians of Gaul, for example, were Kings of the Franks, never Kings of France. King Aedàn, Robert the Bruce and their Stewart successors were Kings of the Scots, never Kings of Scotland. It was this implicitly ’social’ concept which the High Church found so difficult to overcome, for the bishops preferred to have dominion over ’territorial kings’, while the people’s senior lord and master was supposed to be the Pope. Only by maintaining ultimate spiritual control over individuals could the Church reign supreme, and so whenever a Grail dynast came to the fore he was met by the wrath of the papal machine. Even into the Middle Ages - long after the Norman Conquest of England - the Nazarene Church and the long-prevailing cult of Mary Magdalene were prominent in Europe. Women’s rights of equality were upheld throughout the Celtic structure-and this was an enormous problem for the male-only priesthood of orthodox Christianity. The underlying principle of the Grail monarchs was always one of Service, in accordance with the Messianic code established by Jesus when he washed his apostles’ feet at the Last Supper. And so the true Grail dynasts were kings and guardians of their realms, but they were never rulers. The Grail code recognizes advancement by merit and acknowledges community structure, but, above all, it is entirely democratic. Whether apprehended in its physical or spiritual dimension, the Grail belongs to leaders and followers alike. It also belongs to the land and the environment, requiring that all should be "as one" in a common, unified Service. Throughout the ages, parliaments and governments have had as much trouble as the Church in confronting the Messianic social code, and the position is no different today. Presidents and prime ministers are ’elected’ by the people. They are supposed to represent the people. But do they? In actual fact, they don’t. They are always affiliated to a political party, and they achieve their positions by way of majority party vote. But not everybody takes the trouble to vote, and sometimes there are more than two parties to vote for. Consequently, at any given time, more than half the people of a nation may not be represented by the political party in power. In this regard, even though a ’majority vote’ has been applied, the democratic principle fails. What emerges is not "government by the people, for the people", but "government of the people". Jesus confronted a very similar situation in the first century. At that time, Jerusalem and Judaea were under Roman occupation, with King Herod and the Governor, Pontius Pilate, both appointed by Rome. But who represented the people? The people were not Romans; they were Holy Land Jews-Pharisees, Sadducees, Essenes and the like. Apart from that, there were large numbers of Samaritans and Gentiles (non-Jews, the Arab races). Who represented them? The answer is "no one", until Jesus made it his mission to do so. This was the beginning of the Grail code of non-affiliated princely service - a code perpetuated by the Messianic dynasts in their continuing role as "common fathers" to the people. The Grail code is based on the principles of liberty, fraternity and equality, and it was particularly apparent in the American and French revolutions, both of which discarded the lordship of despotic aristocracy. But what has replaced it? It has been replaced by party politics and largely non-representative government. From the Middle Ages there were a number of chivalric and military orders specifically attached to the Messianic Blood Royal in Britain and Europe. They included the Order of the Realm of Sion and the Order of the Sacred Sepulchre. But the most prestigious of all was the Sovereign Order of the Sangréal the Knights of the Holy Grail. This was a dynastic order of Scotland’s Royal House of Stewart, the royal house which in the 14th century introduced the unicorn of the Cathars as the sovereign emblem of Scotland. Shortly afterwards, they introduced the prestigious Order of the Unicorn, which carried the Grail motto "All as One". Like King Arthur, the Stewart Kings also had a dual Desposynic heritage from both Jesus and his brother James. In fact, from the 1370s they were the senior house of the Messianic line, and they were Europe’s longest-reigning dynasty, holding their crown for 317 years until finally deposed by the Anglican Church in 1688. They were deposed because, in compliance with the Grail code, they claimed affinity to God and the nation before Parliament, the Church and the aristocracy. Today, the senior legitimate descendant in this line is HRH Prince Michael Stewart, Count of Albany (The Forgotten Monarchy of Scotland). Today, however, we are in a new age of ’questing’, as many people grow more disillusioned with the establishment dogmas that prevail. We live in an age of satellite communications, sound-barrier travel, computers and the Internet-so the world is effectively much smaller than before. In such an environment, news travels very quickly, and the truth is far more difficult to restrain. Also, the very fabric of the ’male-dominated’ Church and governmental structures is being questioned, and it is generally perceived that the old doctrines of spiritual control and territorial management are not working. More and more people are searching for the original, uncluttered roots of their faith, and for their purpose in society. They are seeking more effective forms of administration to combat the all-too-apparent slide into social and moral decline. They are, in fact, questing for the Holy Grail. This quest for new enlightenment is considerably heightened by the coming new millennium, and there is a widespread feeling that this should also present a new Renaissance, an era of rebirth wherein the precepts of the Grail code are acknowledged and practiced-the precepts of liberty, fraternity and equality. Grail lore spells out loud and clear that the wound of the Fisher King must be healed if the wasteland is to return to fertility. And so, given that I had been afforded privileged access over past years to the archives of the Knights Templars, the Celtic Church and the Messianic sovereign houses of Europe, the time arrived for me to play my own small part in trying to heal the age-old wound of the Fisher King. 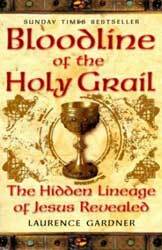 The result was my book, Bloodline of the Holy Grail.